The Landscape Committee is responsible for monitoring the overall condition of the landscape, ensuring proper maintenance is completed, and for making recommendations for continued enhancements to the landscape. The Architectural Control Committee is one that looks at and recommends to the Board any modification a resident wishes to make to the outside of their condo. It looks into the modification and either recommends it or turns it down. The committee then passed it on to the Board for their final vote. The Irrigation Chair is the liaison with the current irrigation contractor. It also assists in the implementation of new irrigation projects. Any problems with the irrigation system throughout our community should be directed to the Irrigation Chair for resolution. The Snow Removal Chair is our liaison with the snow removal contractor. The contractor is required to remove snow falls of 2 inches or more. The order of removal is: main road – driveways – sidewalks - entrance walks. All concerns from the homeowners and contractors should be directed to the Snow Removal Chair for resolution. Trash removal is provided by Waste Management of Michigan, Inc. 866 797-9018. For more information click on Trash Removal Guidelines and Recycle Guide. Our Novi Police Liaisons is Officer Joshua Chapman. The following comments were provided for our residents. Please also remind your residents to lock their vehicles and houses. We encourage all of your residents to call 911 if they see anything suspicious happening in the neighborhoods. We are trying very hard to partner with our community to make this a safe and enjoyable community for all the residents and visitors that you may have, and would hate to have any interactions with the residents due to negative experiences that may occur i.e. vehicles broken into, house burglarized etc. But this can only happen if everyone works on the same page and helps us out as much as they can since we are unfortunately unable to be everyone all the time. The Welcoming Committee offers a first contact to our new members. It's function is to greet the new home owners with a small gift plus give out a packet of vital information from the Homeowners Association. This packet includes but is not limited to: Important telephone numbers of the Board members, other active committee members, police, fire, poison control, etc. 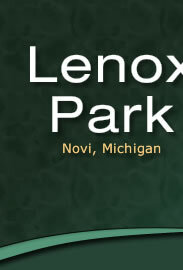 The Social Committee provides social get-togethers for the residents of Lenox Park. It is a good way for the residents to meet and enjoy each other’s company. The committee organizes fun events such as pot-luck dinners, summer picnics, the Casino Day trip, and the Halloween “you’ve been booed” experience. The Clubs and Groups provide a way for members with similar interests to meet and share those interests. We presently have a dinner group, card playing groups, Bunco, Mahjong, theater, and book clubs .